The Special Features of this attractive Traditional Style home include 9’ ceilings, a comfortable covered balcony at the front, home office, workable kitchen, breakfast area, 4 well organized bedrooms, and an unfinished 1,296 sq basement. 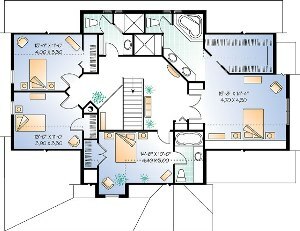 1st level: Entry hall, office, half-bath, family and dining rooms with central fireplace, kitchen with island and lunch counter, breakfast area with access to a covered balcony, laundry facilities. 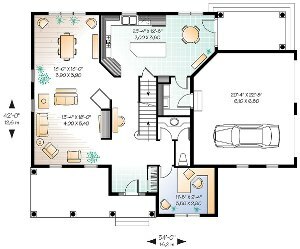 2nd level: Master bedroom suite with walk-in closet and private bathroom, secondary bedroom with private bathroom, 2 other secondary bedrooms, showers room. The perimeter of the building has 4 corners. The living area is 2,768 square feet. The number of stories is 2. Basement: 1296 square feet of unfinished basement. Central ducted heating and cooling. 1 each insulated prefab metal fireplace, brick face. To estimate cost, I’ll use the construction cost software as described on Getting Started. Using this foundation shape for the foundation on the Cost Estimating Software for Burlington, Vermont area, I came up with $362,890 including a General Contractor Markup of $41,429. That’s an approximate cost of $131 per sq. ft. I came up with this estimate by using Quality Class 4 on the estimating software throughout the estimating process. 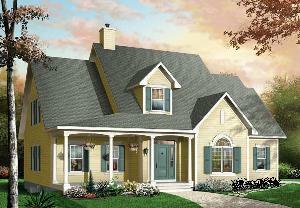 The cost to build for this example, or any house plan, can vary considerably depending quality of materials selected, and on actual bids for labor and material. Note: Land and possible related fees (if any) are NOT included in the cost to build. Read more on fees on my Checklist for buying land on How to Buy Land and Build a House.